The parliament’s national security committee has approved amendments proposed to the Decentralisation Act to authorise the president to determine the public services to be provided by the opposition-majority Malé and Addu city councils. Ruling Progressive Party of Maldives (PPM) MP Mohamed Waheed Ibrahim’s bill states that president can assign municipal services to the Malé city council or transfer them to government ministries. The amendment bill was sent to committee last week with 33 votes in favour and 15 against. The committee completed its review process today. As suggested by pro-government MPs during last week’s debate on the legislation, the oversight committee also added a clause to authorise the president to determine the powers and responsibilities of the opposition-majority Addu City council as well. The bill was passed with the support of two opposition Jumhooree Party MPs on the committee. Two main opposition Maldivian Democratic Party (MDP) MPs voted against it. Reflecting its majority in the 85-member house, the PPM and coalition partner MDA have voting majorities in all parliamentary committees. The MDP had won a majority of seats in the Malé and Addu City councils in both the February 2011 and January 2015 local council elections. 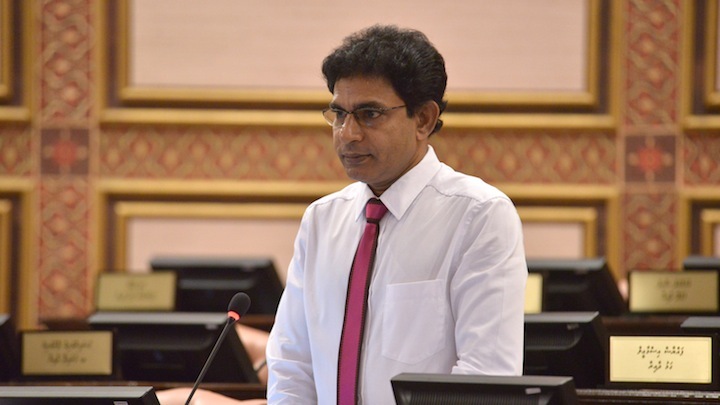 The parliament today accepted for consideration a bill that would authorise President Abdulla Yameen to determine the public services to be provided by the opposition-majority Malé city council. Ruling Progressive Party of Maldives (PPM) MP Mohamed Waheed Ibrahim’s revisions to the decentralisation law states that municipal services the president decides not to assign to the council will be transferred to government ministries. If the amendment bill is passed, the president must determine the powers and responsibilities of the council within a month in consultation with his cabinet. The current administration is using its parliamentary majority to consolidate all powers of the state with the executive and paving the way for “autocratic rule,” the opposition MPs said. But Waheed said the changes were necessary due to the council’s alleged corruption and behaviour as “a separate government”. Other PPM MPs accused the council of obstructing the government’s efforts to develop the capital and focusing primarily on the MDP’s activities. Pro-government MPs said the council had failed to solve the city’s garbage and flooding problems, but opposition MPs said the government had not granted the funds necessary to fulfil the council’s responsibilities. Waheed’s bill follows the housing ministry evicting the council from the city hall building last month. In a long-running struggle, the housing ministry had also taken over management of Malé City’s public spaces, parks, harbours, cemeteries, and roads from the city council. MP Ibrahim Mohamed Solih, parliamentary group leader of the MDP, said the amendments are contrary to the spirt of the 2008 constitution. The changes would undermine the concept of separation of powers and decentralised administration envisioned in the constitution, he said. Following preliminary debate, the amendment bill was accepted for consideration with 33 votes in favour, 15 against, and sent to the national committee for further review. The People’s Majlis convened today for its second session of the year after a one-month recess. New office space offered to Malé city council office by the government is infested with rats and fungus, says deputy mayor Shifa Mohamed. The housing minister ordered the opposition-dominated council last week to vacate the city hall building at Galolhu Billoorijehige and move to smaller offices at the Huravee building within seven days. Shifa told Minivan News today that the council has shared numerous concerns regarding safety and hygiene with the civil service commission. “There is fungus on the walls of the building. The building has a pungent smell and there are rats and rat holes everywhere,” she said. Nearly 60 civil service staff at the council have filed a petition at commission, saying the building is unfit for office work. The city hall takeover was the latest incident in a long-running power struggle between the ministry and the council. Earlier this year, the ministry transferred a third of the council’s employees to the ministry. Shifa said the council has asked the ministry for an extension of the seven-day deadline for the move, but is yet to receive a response. “The ministry is not responding to any political staff at the city council,” she said. Services provided to the public could be interrupted if the ministry does not grant an extension, she added. Local media observed cracks on the walls, several rat holes and waste leaking onto the carpet floor of the new office. Civil service commission president Dr Mohamed Latheef declined to comment on the state of the building until the council officially requests for assistance. “We do not want to get involved with the matter,” he said. However, he assured assistance and an inquiry as soon as the council officially files a complaint. The letter evicting the council from city hall was signed by acting housing minister Thoriq Ibrahim. The ministry also ordered the council to hand over the compound building the Billoorijehige building and the local market. Thoriq said the cabinet had decided on April 19 that the building was better suited for government offices. The Local Government Authority has voted to remove Chairperson Colonel (retired) Mohamed Nazim and Vice President Moosa Naseer. Five of the nine board members supported a no-confidence motion against Nazim, who is also minister of defence and acting health minister. The five board members took the vote after having refused to leave today’s board meeting following Nazim’s failure to table a no-confidence motion against himself. Malé City Councillor and LGA board member Shamau Shareef explained that Nazim had insisted the agenda for yesterday’s cancelled meeting be attended to before any other issues were addressed. Shamau noted that Nazim had prevented the board taking a no-confidence vote against him in December. He had previously explained to Minivan News that a binding resolution to do so had been signed by four members on December 24. He stated today that five board members, including himself and Hussain Naseer, Hussain Hilmy, Ibrahim Rasheed, and Shujau Hassan refused to adjourn the meeting, requesting LGA officials write to the attorney general for advice. Shamau expressed concern that Nazim was not working to protect local government in the country while “the government is dismantling the whole system of decentralisation”. Both Nazim – appointed to the board by President Abdulla Yameen, and Moosa Naseer will continue to hold positions on the LGA board. Nazim referred any media queries to LGA’s media coordinator Mohamed Azmeen. Azmeen said that today’s meeting had been halted after disagreements between the chair and members over the agenda. He had confirmed that the board was to decide on how to proceed with the issue after the attorney general’s advice, but was not responding to calls following the board’s subsequent dismissal of Nazim this afternoon. 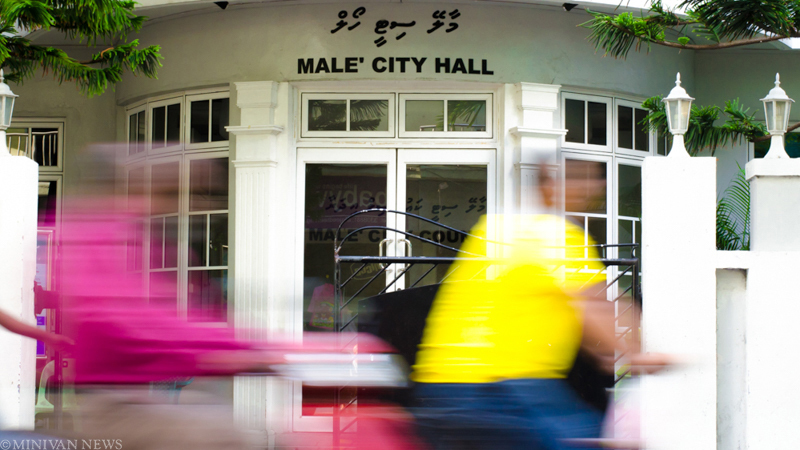 Formed under the 2010 Decentralisation Act, the LGA is tasked with overseeing and coordinating the work of the Maldives’ 199 city, atoll, and island-level councils. The LGA board is required under the act with ensuring that “the work and activities of the councils created under this Act is functioning in accordance with the Constitution, this Act, and other Laws”. The original Decentralisation Act assigns a number of services and lands to the councils, though failure to make amendments to relevant legislation – particularly the Land Act and the Finance Act – has led to contradiction in the current laws. Concerns over the government’s plans for decentralisation prompted councils from the country’s southernmost atolls to sign a pact to defend the system last month. The Medheaari Declaration – signed by the Gaaf Dhaalu, Gaaf Alifu, and Fuvahmulah atoll councils, and Addu City Council – called upon the government to protect decentralisation, as well as making plans to secure the fiscal autonomy of the signatories. This article was updated shortly after its original publication to include the board’s decision to pass the no-confidence motion against Chairperson Nazim. The Civil Court has issued a sentence stating that the Malé City Council is not liable to pay damages to Yacht Tours Pvt Ltd after the company filed a case accusing the council of breaching the terms of the West Park Cafeteria lease. Yacht Tours – owned by former Kaashidhoo MP Abdulla Jabir – filed the case after the city council leased out West Park to former professional tennis player Amir Mansoor in September 2012. Jabir accused the council of breaching a contract made in 2005, when the city council was known as the Malé Municipality. The company had accused the council of breaching Article 11 of the contact which stated that the company should be granted the opportunity to extend the contract before it expires, while requesting the court to issue a temporary order prohibiting it from handing West Park to another party. However, the court sentence today stated that the company was unable to prove it had formally requested an extension to the contract six months prior to the termination as required under Article 11 of the contract. The Civil Court had previously thrown out the case after the then Yacht Tours Lawyer Mohamed Anil refused to accept a chit handed to him by the court, in which the council accused the company of trying to drag out court proceedings in order to garner profit from the café. Speaking at the court the second time the case the was filed, former Attorney General Diyana Saeed – also Jabir’s wife – represented Yacht Tours, saying that Anil had refused to accept the chit without consulting the company. 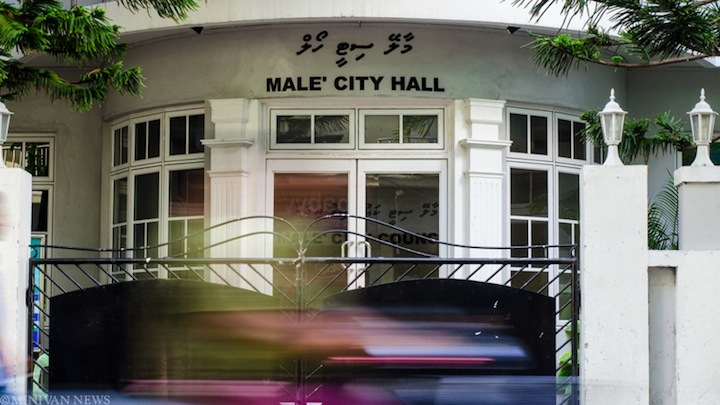 The opposition dominated Malé City Council (MCC) has expressed concern after 377 of its employees were transferred to the Ministry of Housing and Infrastructure. Malé City Mayor Mohamed Shihab has said that all council employees working in the road maintenance department had now been transferred to the housing ministry without any prior notification. “The council received a letter from the President’s Office saying that cabinet had decided to transfer management of the the roads to the housing ministry,” said Shihab. “The letter also read that all public squares and parks would also be transferred to the Housing Ministry”. A statement from the ministry earlier this month said that it had taken control of 13 plots of land formerly controlled by the council and transferred the majority of the council’s public services division staff to the ministry. The council’s jurisdiction of the city’s roads was removed in November. Deputy Mayor Shifa Mohamed said today that the council was given two hours to provide a list of all employees to the government after which 345 employees were transferred. The council originally had 900 employees working under it, including migrant workers, the council explained. Mayor Shihab said that the council has only been operating within the powers granted to it by the Decentralisation Act, adding that the current government has been persistently making its work difficult. He explained that the council has decided to file a case at the Civil Court regarding the government’s stripping of its responsibilities, and the subsequent distribution to different government ministries. Last month, nearly all services at the council came to a halt after police confiscated important documents and several hard drives, including the server system necessary for daily operation. However, the council denied the corruption allegations which alleged some staff had used documents sent by the housing ministry to gain unlawful advantages. Shifa has previously suggested that the government was plotting to “destroy decentralisation” after the housing ministry seized numerous plots of land from the council including two parks, artificial beach, carnival area, south harbour area, Usfasgandu, Dharubaaruge, and land near the T-Jetty in May. In October, she complained that poor allocation of funds for road development projects under the council was one of the main reasons behind the severe floodings on the western side of the capital island during heavy downpours. The council’s jurisdictions over the roads was subsequently removed. October also saw masked individuals wielding machetes cut down over 30 council-owned areca palm trees along the capital’s main thoroughfare, Majeedhee Magu. Meanwhile, former President Mohamed Nasheed alleged police involvement in the chopping down of the palm trees while naming several Special Operations officers after the council had requested that the public submit any information about the issue. Local Government Authority (LGA) board members have tabled a no-confidence motion against Chairperson and Minister of Defence Colonel (retired) Mohamed Nazim. Board members Shamau Shareef and Shujau Hussein have told Minivan News that Nazim has refused to follow procedures in considering the motion. “He should consider it immediately. He said he is president and he can do whatever he wants. He was very arrogant, and very childish,” said Shujau Hussein, the public’s representative on the board. Following a proposal from another board member to postpone consideration of the motion today, four of the nine members signed a resolution to consider it on December 31. This resolution was rejected by Nazim, explained Shujau. Both Shujau and Malé City Councillor Shamau expressed concern that Nazim – also acting minister of health – was not working to protect decentralisation in the country. “He is not standing up to protect the system,” suggested Shamau, who noted that the chair had failed to protect Malé City Council from persistent reduction of its powers. “His answer was that, since he is sitting in the cabinet, he can’t speak against colleagues,” explained Shamau. Shujau – who said he had presented 18 procedural issues to support today’s motion – pledged to take the matter to the Civil Court if it is not heard on December 31. Removal of public lands from the purview of Malé City Council earlier this month left the opposition-dominated authority with next to no authority, after the gradual removal of powers since 2012. The LGA board is tasked under the act with ensuring that “the work and activities of the councils created under this Act is functioning in accordance with the Constitution, this Act, and other Laws”. When asked to comment on today’s events Nazim told Minivan News that he would have a spokesman explain what had been discussed at today’s meeting, though no spokesman had called at the time of publication. Concerns over the government’s plans for decentralisation prompted councils from the country’s southernmost atolls to sign a pact to defend the system earlier this week. The Medheaari Declaration – signed by the Gaaf Dhaalu, Gaaf Alifu, and Fuvahmulah atoll councils, and Addu City Council – calls upon the government to protect decentralisation, as well as making plans to secure fiscal autonomy. “What happened in Malé, will it be repeated in the atolls?” asked Addu City Council Mayor Abdulla Sodig. “We always have the fear that the government will come after Addu City Council after it deals with Malé City Council,” he told Minivan News. Recently proposed amendments to decentralisation – from pro-government MP Riyaz Rasheed – called for a reduced number of local councils and to cut the salaries of all councillors except the council presidents. The government proposed similar changes in March of this year to the previous Majlis, with Nazim stating that the changes would allow professionals to hold council positions without having to leave their jobs. The government has also expressed a desire to cut down on the cost of decentralised governance. The current model of more than 1,000 elected councillors approved in 2010 by the then-opposition majority parliament was branded “economic sabotage” by the Maldivian Democratic Party (MDP) government, which had originally proposed limiting the number of councillors to no more than 220.